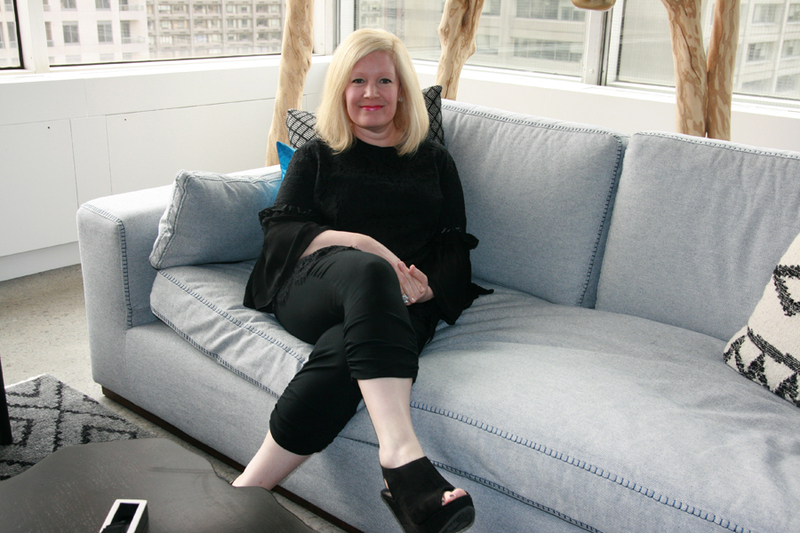 Jodi Kasten, the general manager and vice-president of sales for Indeed.com’s Canadian division, recently invited us to visit the job search engine’s brand-new office in Toronto’s trendy Yorkville neighbourhood. Join us for the tour. Most offices tuck their cafeterias to one side, but not Indeed, which has its largest kitchen double as a common space with tables, couches, and what we think would be the perfect playground for parakeets, though unlike some companies we could name, Indeed employees have never brought a pet here. 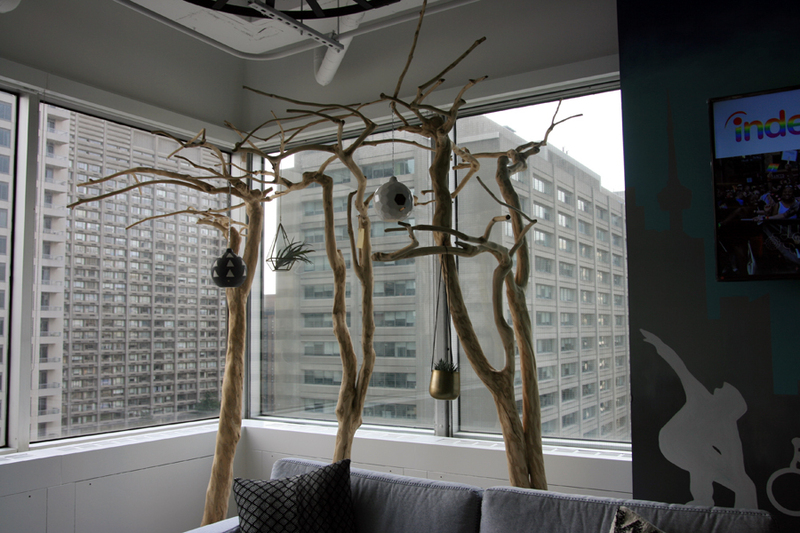 “It hasn’t been a request,” Kasten says with a laugh, noting that the tree is designed to create a “California vibe,” rather than accommodate budgies. “Around 88 per cent of our employees are millennials,” Kasten says. 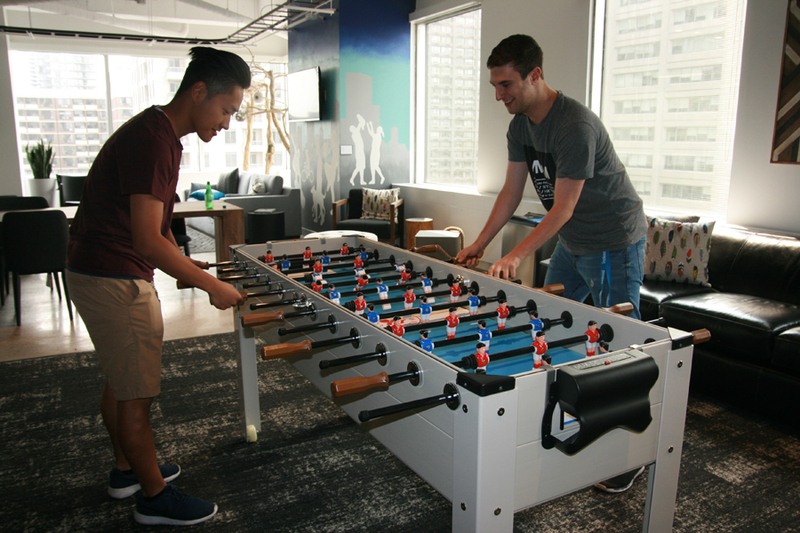 “So creating an engaging office environment was top of mind for us.” One method: A cafeteria that can serve as a ping-pong or foosball arena as easily as it acts as a town hall space. 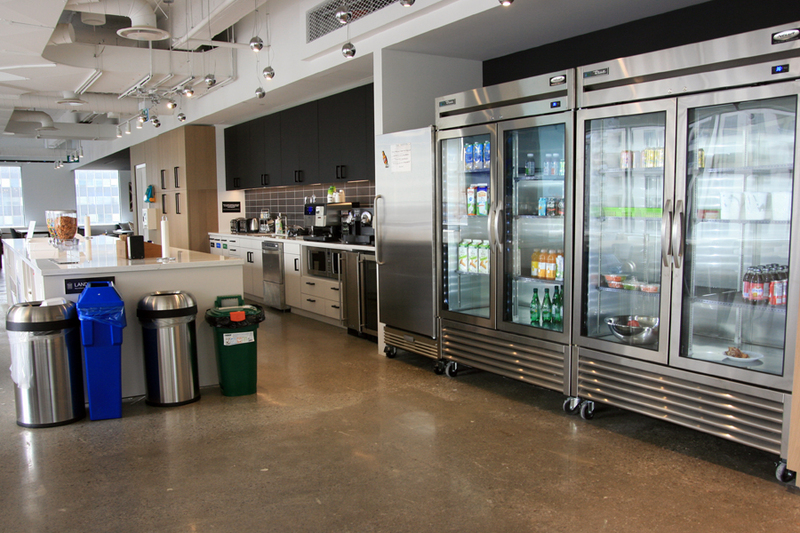 It wouldn’t be a tech company’s headquarters without a well-stocked cafeteria, and Indeed’s employees get a few perks we haven’t seen before, such as crushed ice and sparkling water on tap, in addition to an endless supply of drinks, snacks, and vegetables. Hot lunches are also served every Monday, and hot breakfast every Friday. “It keeps everybody connected at a few points during the week,” Kasten says. Befitting the average age of its workforce, Indeed wanted to make sure that technology was at the forefront of its headquarters’ design, Kasten says. 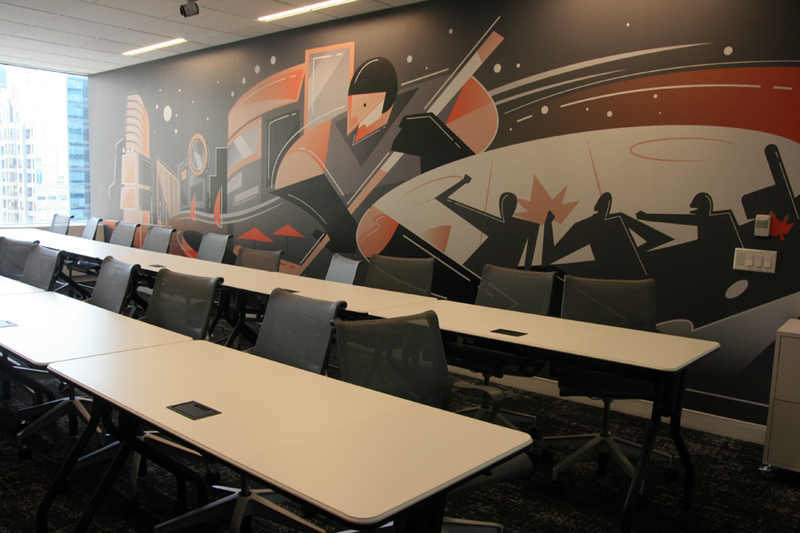 Consequently, each of the meeting rooms are fitted with video conferencing technology that allows employees to connect with their colleagues around the world. 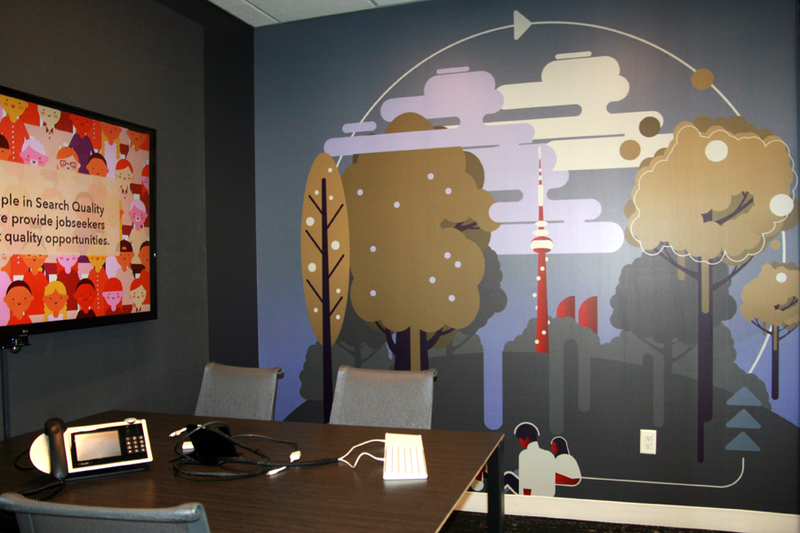 This is the “Ossington” meeting room, which incorporates Toronto’s iconic CN Tower. 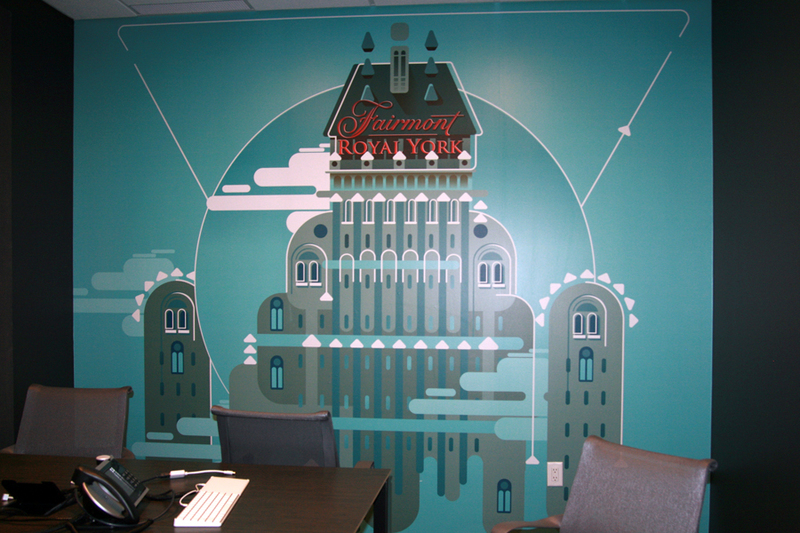 Next door is the Front Street mural, which commemorates the city’s famous Royal York Hotel. Most companies that invite us to their offices don’t like us shooting pictures with lots of employees around, but Kasten didn’t mind. 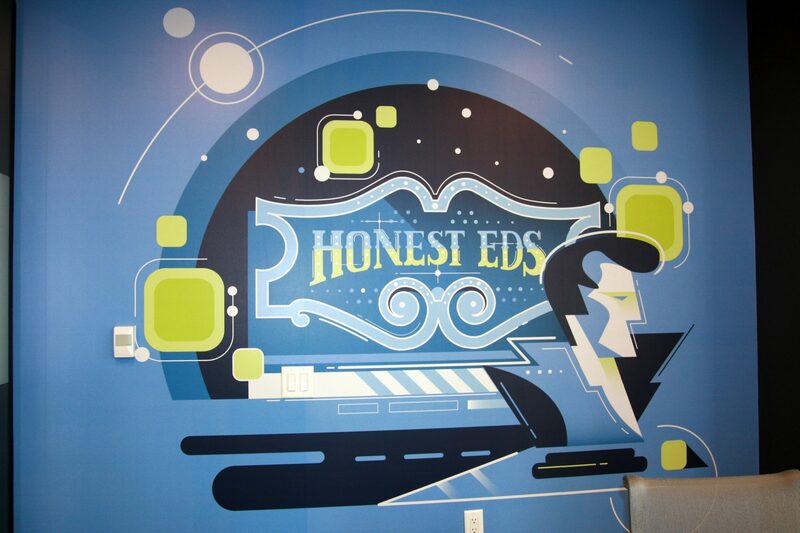 The majority of employees here are in sales, with sizable client services, marketing, finance, HR, and recruiting teams supporting them. In four short years, the company has grown from three Canadian employees to more than 130, with offices in Toronto, Montreal, and Calgary. 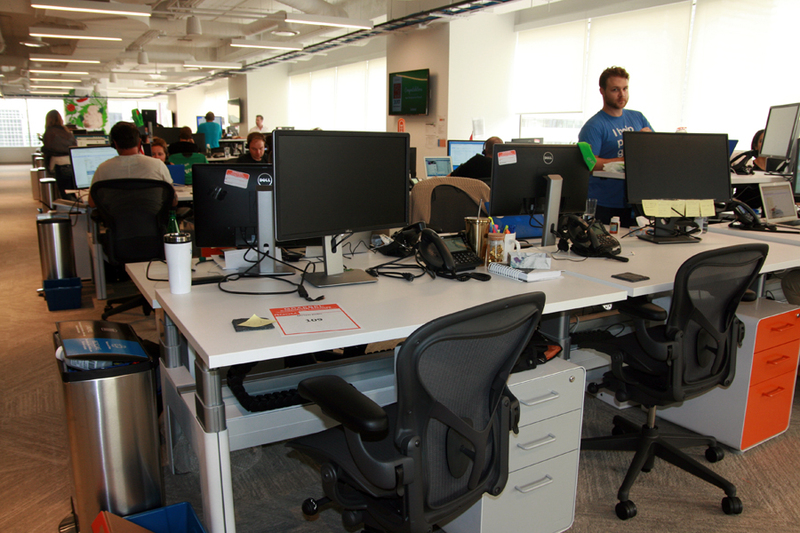 Note the adjustable desks, a new feature that Kasten says has met with approval. 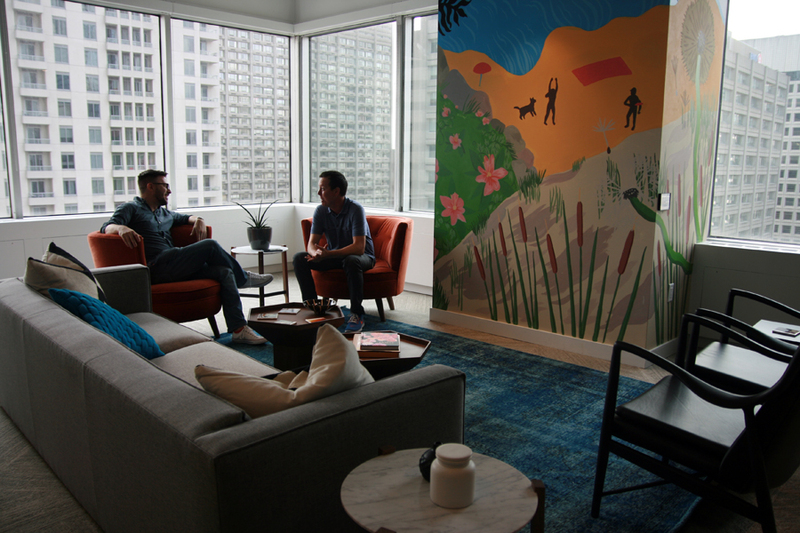 Each corner of the company’s 14th-floor office space features a meeting area like this one, with a mural, couches, coffee tables, and, more often than not, chatting employees. Another kitchen (with free cupcakes on the day we visited) is nearby as well. 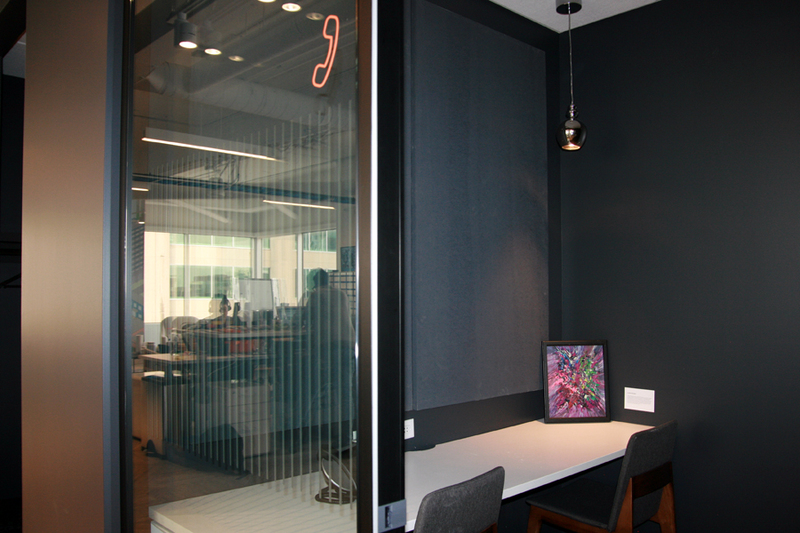 Unlike the meeting rooms, these “phone booths” don’t have to be booked in advance, and are designed to give employees a quiet place for private conversations, Kasten says. 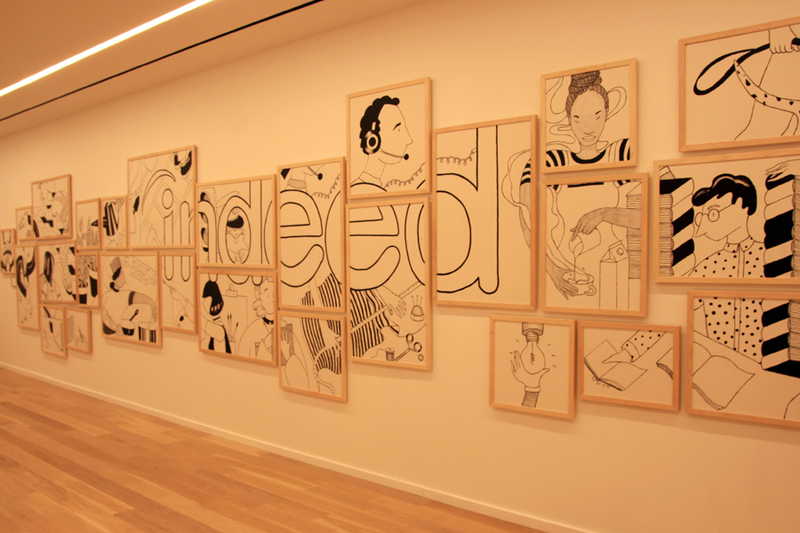 Indeed’s “living room” is better-looking than our own… and many of the ones we’ve seen in Canadian Living, for that matter. 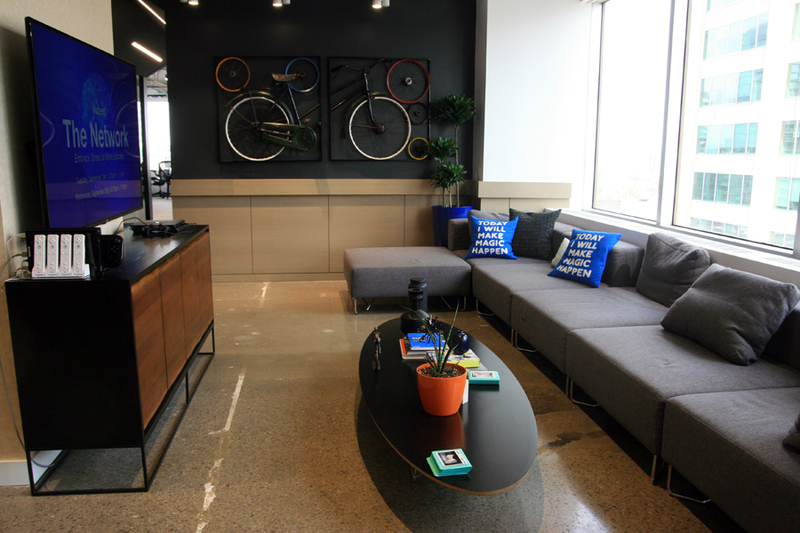 The goal, Kasten says, is to give employees a series of meeting spaces as distinctive as the variety of jobs Indeed helps people find. Like Honest Ed’s, the dearly departed Toronto department store commemorated in the “Bathurst” meeting room, Indeed’s new office has produced “lots of smiles” among employees since its Sept. 11 opening, Kasten says.